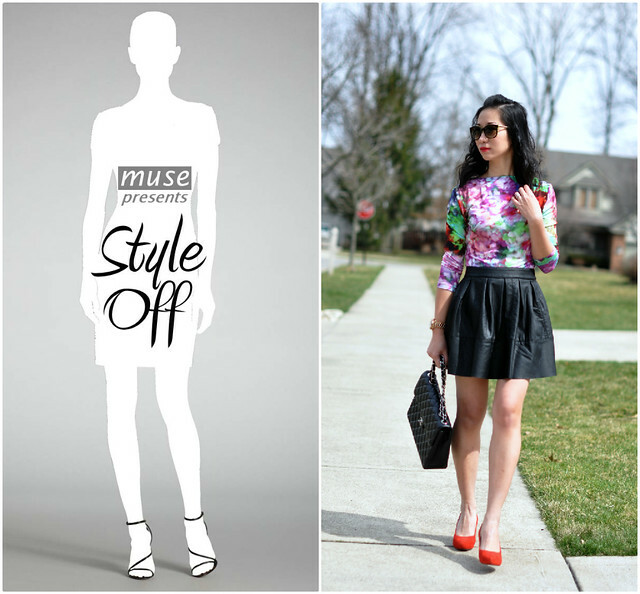 This is the final look I did for Muse Apparel's #StyleOff contest. For this look, I wore the dress as a top backwards. Yes, I did it again. I love the cleanliness and simplicity of the boat neckline. Since this top (dress) provides full coverage of the chest area, I wanted to pair it with a short skirt for a more playful look. Put on some red lipstick and I am ready for a date night =) I hope you enjoy this series as much as I do. Today is the last day to vote for me. You must “like” Muse Apparel’s Facebook page to vote. In return, one of my voters will have a chance to win the dress I am wearing here (in a size of your choice). This campaign will end today at 6:00 pm. The winner will be announced on the Muse Apparel Facebook page as well as on this blog. Love the edginess of this last look with the leather skirt and bright red lips and shoes. Voted for you. Good luck! Can we vote more than once (such as once per day)? That is the cutest leather skirt I've seen! I love how you paired it with the colorful dress. How do you like the skirt? Does it wrinkle easily like PU tends to do? Dress as a top is a wonderful idea. You rocked this one, but I also think the dress alone is lovely. By the way, loving the curls. I like how you pulled this look together: fem with an edge. Wow! Super glamorous! You have really amazing style. i love how you turned the dress into a shirt! 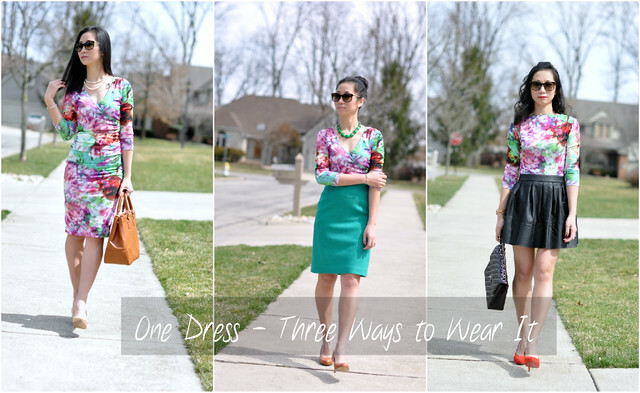 I love all three of these options, especially turning the dress backwards. Great! Okay, I just pinned that dress and hopefully they'll still have it in stock when I get paid next. I LOVE that it works as both a dress and a top and I never would have thought to put it backwards. Amazing!